Check out the luxurient sponge growth on this old car. 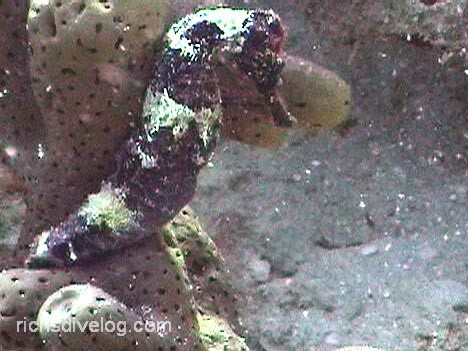 Mature seahorse near the mooring rope at Armageddon. Dive Journal: We’re back diving with N2 The Blue again, launching again from the Fredericksted Pier. We head again north, this time to a site called Armageddon. Johnny has elected to pass on this dive. Armageddon is a comparitively strange site where the town of Fredericksted decided to dump the remains of its old pier. The site contains hundreds of huge steel I-beams, pilings, culverts, tires, and even an old car. I’m immediately thinking it looks like some scene from the movie Waterworld. 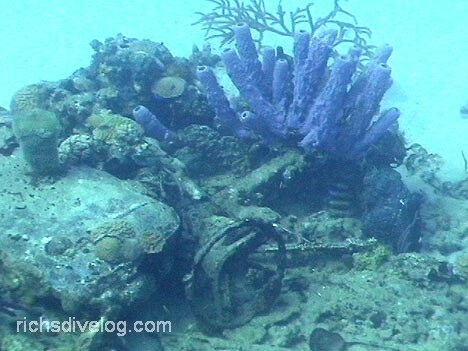 The site is spread out over a large area in 60 to 90 feet of water, too large to explore in one dive. Interesting site! Back at the mooring ball, Anna points out a large resident seahorse.